Phoenix (/ˈfiːnɪks/) is the capital and most populous city of Arizona, with 1,626,000 people (as of 2017). It is also the fifth most populous city in the United States, and the most populous American state capital, and the only state capital with a population of more than one million residents. Phoenix is the anchor of the Phoenix metropolitan area, also known as the Valley of the Sun, which in turn is part of the Salt River Valley. The metropolitan area is the 11th largest by population in the United States, with approximately 4.73 million people as of 2017. 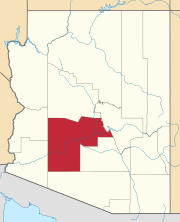 Phoenix is the seat of Maricopa County and the largest city in the state at 517.9 square miles (1,341 km2), more than twice the size of Tucson and one of the largest cities in the United States. As of 2014, the Phoenix MSA had a Gross Domestic Product (GDP) of just over $215 billion. The top five industries were: real estate ($35.5B), Finance and insurance ($18.8B), manufacturing ($18.2B), Retail trade ($16.6B), and health care ($16.6B). Government, if it had been a private industry, would have been ranked third on the list, generating $18.9 billion. As of 2010, the top five employment categories were office and administrative support (17.8%), sales (11.6%), food preparation and serving (9%), transportation and material moving (6.1%), and management (5.8%). The single largest occupation is retail salespersons, which account for 3.7% of the workforce. As of January 2016, 10.5% of the workforce were government employees, a high number because the city is both the county seat and state capital. The civilian labor force was 2,200,900, and the unemployment rate stood at 4.6%. As of 2005, the metropolitan area of Phoenix contains one of the nation's largest and fastest growing freeway systems, consisting of over 1,405 lane miles (2,261 lane km). The freeway system is a mix of Interstate, U.S., and state highways which include Interstate 10, Interstate 17, US 60, Loop 101, Loop 202, SR 51, SR 143, and Loop 303. There are still major additions to routes 101, 202 and 303 underway, as well as several other smaller projects around the valley. State Routes 87, 85, and 74 connect Phoenix with other areas of the Valley and Arizona. Ak-Chin Pavilion (originally known as the Desert Sky Pavilion) is an amphitheater located in Phoenix, Arizona, which seats 8,106 under a pavilion roof and an additional 12,000 on a hillside behind the main stands. It opened on November 11, 1990 (Billy Joel was the venue's inaugural performer). The naming rights sponsor is the Ak-Chin Indian Community (the venue is not located on tribal land). With a total capacity of 20,000, its capacity is higher than Talking Stick Resort Arena and Gila River Arena. The amphitheater's season starts in April and closes in October. The Arizona Diamondbacks, often shortened as the D-backs, are an American professional baseball team based in Phoenix, Arizona. The club competes in Major League Baseball (MLB) as a member of the National League (NL) West division. The team has played every home game in franchise history at Chase Field, formerly known as Bank One Ballpark. The Diamondbacks have won one World Series championship (defeating the New York Yankees in 2001) – becoming the fastest expansion team in the Major Leagues to win a championship, which it did in only the fourth season since the franchise's inception. They remain the only professional men's sports team from Arizona to have won a championship title. Cable One, Inc. (branded as Cable ONE) is an American Internet and cable service provider and former subsidiary of Graham Holdings Company. The company's name and current focus dates back to 1997; prior to that time the company was known as Post-Newsweek Cable. It is headquartered in Phoenix, Arizona, though it does not service the Phoenix area. Camelback Mountain (O'odham: Cew S-wegiom) is a mountain in Phoenix, Arizona, United States. The English name is derived from its shape, which resembles the hump and head of a kneeling camel. The mountain, a prominent landmark of the Phoenix metropolitan area, is located in the Camelback Mountain Echo Canyon Recreation Area between the Arcadia neighborhood of Phoenix and the town of Paradise Valley. It is a popular recreation destination for hiking and rock climbing. Comerica Theatre (formerly Dodge Theatre) is a multi-use theatre in Downtown Phoenix, Arizona. The venue seats 5,000 people and hosts many musical artists and shows. Jerry Colangelo, longtime former owner of the Phoenix Suns and Arizona Diamondbacks, was one of the original investors. The facility, designed by Dan Meis of NBBJ, was designed to fill the need for performers that don't need a huge sports stadium, but are too large for the smaller, intimate venues. It opened in the spring of 2002 as part of the ongoing redevelopment efforts in Downtown Phoenix, and reached the 2 million mark in attendance in 2009. Live Nation began operating the venue in 2007. The theater's name was changed in October 2010 after Comerica Bank acquired the naming rights. The theatre is also known for hosting sporting events such as boxing. The theatre is probably best recognized as the stage for the comedy movie Blue Collar Comedy Tour: The Movie. In addition to this, George Lopez's most recent HBO Special, America's Mexican, was aired live at the venue. Rock group Chickenfoot recorded their live album Get Your Buzz On there and it also hosted the 2010 WWE Hall of Fame Induction Ceremony. It is also a venue for Broadway and family stage shows that play the Phoenix area, and in the theater's first few years the Arizona edition of the Radio City Christmas Spectacular took place at the venue. Mexican pop singer Paulina Rubio performed here on May 14, 2005, on her "Pau-Lenques" tour in support of her 2004 album Pau-Latina. Lorde brought her Pure Heroine Tour to the theatre on April 17, 2014, performing here in between her two shows at Coachella.Janet Jackson performed a sold-out show at the theatre on April 8, 2011, as part of her Number Ones, Up Close and Personal World Tour. She returned to the theatre on October 19, 2015, as part of her Unbreakable World Tour.Lana Del Rey performed her first show in Arizona at the theatre on April 15, 2014, as part of her Paradise Tour. Latin singer Yuridia performed here on November 21, 2012, as part of her Para Mí Tour. KLNZ (103.5 FM, "La Tricolor 103.5") is a regional Mexican-formatted radio station serving the Phoenix, Arizona area. The station is owned by Entravision Communications. KLNZ is licensed to the nearby suburb of Glendale and broadcasts programming from Entravision's California-based "Radio Tricolor" network. The station also broadcasts with digital HD Radio technology. Its studios are located in Phoenix near Sky Harbor Airport, and the transmitter is located west of Surprise. KOMR (106.3 FM) in Sun City, Arizona, is a Spanish AC radio station serving the Phoenix area. The Univision station, along with sister stations KQMR in Globe and KKMR in Arizona City, is known on-air as "Amor 106.3". The following is a list of the mayors of Phoenix, Arizona. The Phoenix Thunderbirds Open was a golf tournament on the LPGA Tour from 1962 to 1965. It was played at two different courses in the Phoenix, Arizona area: Paradise Valley Country Club in 1962, Arizona Biltmore Country Club in 1963 to 1965. Swift Air is an American airline based in Phoenix, Arizona, United States. It operates a fleet of business and commercial jets available for charter and private use. Its main hub is Phoenix Sky Harbor International Airport. Swimming World is a US-based monthly swimming magazine that was first published in a magazine format as Junior Swimmer in January 1960. It runs an online swimming website (known as SwimInfo prior to 2006). The headquarters is in Phoenix, Arizona.In its earliest form, Junior Swimmer began as a mimeograph/newsletter published by Peter Daland in the summer of 1952. In 1960, Coach Daland passed the responsibility of the project to Albert Schoenfeld due to Daland's greater coaching demands as the swim coach at the University of Southern California and the Los Angeles Athletic Club.The publication then combined with Swimming World in June 1961. Swimming World was a mimeograph/newsletter published for the previous 10 years by Robert J. H. Kiphuth. The newly constituted magazine was then known as Junior Swimmer-Swimming World.It also has correspondents in Europe and Australia, and keeps track of all major FINA-sanctioned competitions, as well as tabulating extensive records of competitions ranging from junior to masters level swimming. It also provides advice on health related and technique issues for people with an interest in swimming. It is also known for awarding "Swimmer of the Year" awards in various categories. Brent Rutemiller is the chief executive officer of Sports Publications International and Publisher of Swimming World Magazine, SWIM Magazine and Swimming Technique Magazine since 2002. Under his tenure, Rutemiller re-branded each media vehicle under one print title, Swimming World Magazine, and then re-launched all three magazines as separate digital downloads. Shortly thereafter, he launched Swimming World Radio and Swimming World TV as online properties. The Morning Swim Show is Swimming World TV's flagship program which streams weekday mornings. The magazine also honors the top high school swim teams and swimmers in the country on an annual basis. In 2015, Rutemiller introduced Swimming World Biweekly as a free digital magazine aggregating the top stories on the Internet every two weeks. WWE Hall of Fame (2010) was the event which featured the introduction of the 11th class to the WWE Hall of Fame. The event was produced by World Wrestling Entertainment (now WWE) on March 27, 2010 from the Dodge Theater in Phoenix, Arizona. The event took place the same weekend as WrestleMania XXVI. The event was hosted by Jerry Lawler. A condensed one-hour version of the ceremony aired on the USA Network that same evening. In March 2015 the ceremony was added to the WWE Network. WWE Worlds Collide was a two-day professional wrestling show and WWE Network event produced by WWE for their 205 Live, NXT, and NXT UK brands. The event took place on January 26 and 27, 2019 at Royal Rumble Axxess and aired on the WWE Network on February 2, 2019.The event featured the 15-man Worlds Collide tournament, with the wrestlers being equally divided amongst the NXT, NXT UK, and 205 Live rosters. The tournament was won by NXT's Velveteen Dream, who chose to face Johnny Gargano for the NXT North American Championship.